From left to right are Riggs, Reggie, Lenny, Jacque, Dexter and Salvi. It has been a long, hard but enjoyable course. 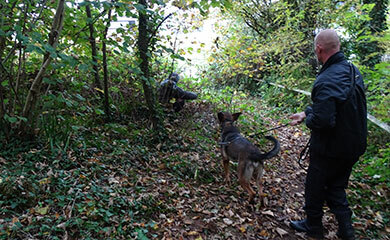 During the 13 weeks of the course the teams have developed their ability to track and search for fleeing or outstanding criminals and vulnerable missing persons. They have been taught how to deal with violent criminals and unruly crowds. 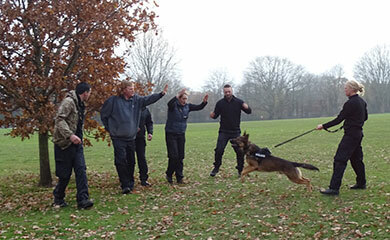 Here is Riggs clearly enjoying moving this crowd on during his licensing assessment. 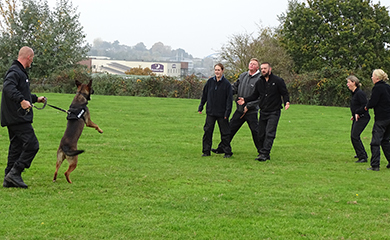 The dogs are also taught to locate any evidence or property discarded by criminals and to indicate to their handler that they have found it. 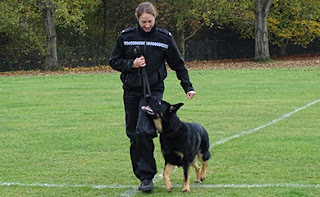 They are not allowed to touch the items to make sure they do not interfere with potential DNA which could identify the offender. Luke is pictured here with Jacque waiting to start their licensing property search. 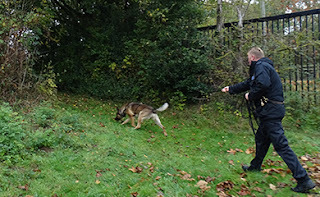 but we needn’t have worried he was just hiding from Riggs on their licensing search assessment. 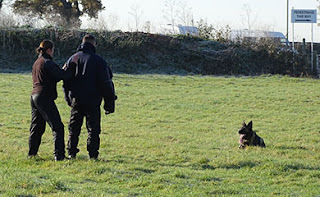 Here is Dexter showing intense concentration following the track of a criminal who has a 45 minute head start on him. Although the dogs love the biting exercises they should not bite if the offender gives himself up. The criminal here is in no doubts the dog means business and running away would be a bad idea. Control over our dogs is very important because one day it may save the dogs life. 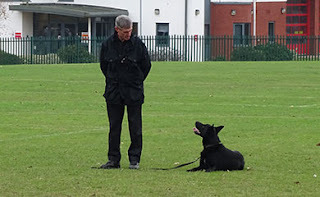 Here is Salvi watching intently to make sure the criminal does not attack his handler Terri. 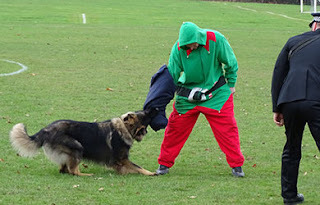 He must remain in a controlled position until his handler returns to him. Here is Lenny taking off after a criminal who is running away. 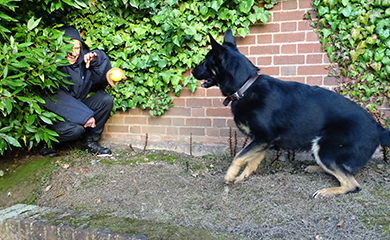 Now if the criminal then changes direction towards a busy main road it is vitally important the handler can immediately call the dog back. Control exercises are performed every day and form the foundation of all of our work. 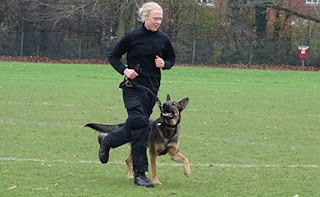 Here is Vikki perfecting her heelwork routines with Riggs at the double pace. Here is Lenny working on his down stay. Here is Reggie giving Andy excellent focus. In between training we found time to take some photo’s of the course in the woods. 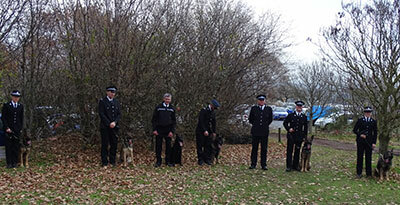 Next it was getting ready for our passing out parade on the Thursday. 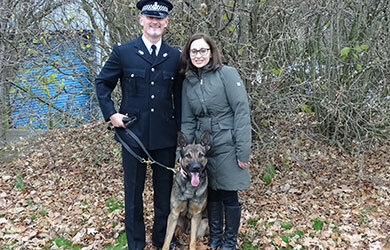 The passing out parade is our opportunity to say thank you to all of our puppy walkers for all their hard work and for the handlers families to also enjoy the day. Graham as always entered into the festive spirit to practise our criminal work. 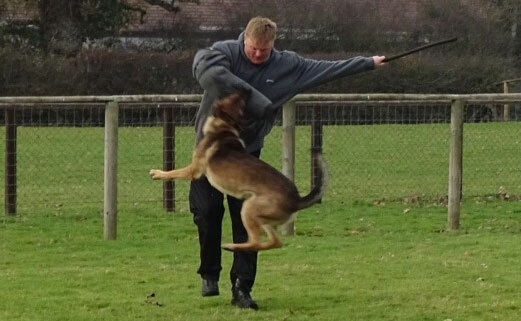 I’m not sure Lenny could take Graham seriously but he bit him anyway. We had an excellent turn out on the Thursday. The teams are pictured here marching on to give a short display. 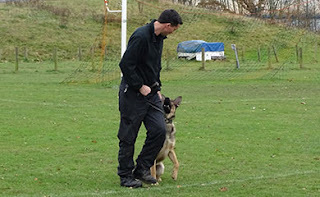 Next it was over to be introduced to the spectators. 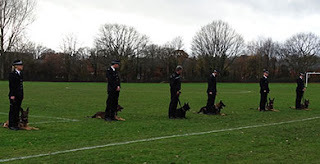 We then gave a display where each dog performed an element of criminal work. 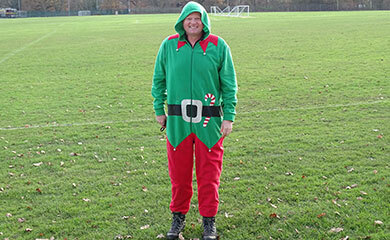 Here is Jacque dispensing some xmas spirit. 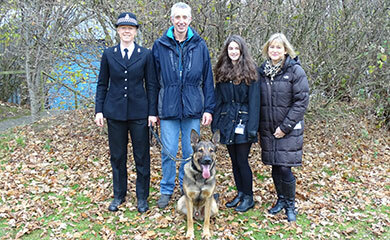 The handlers were then presented with their certificates and our puppy walkers were presented with a framed photograph of the dogs they had puppy walked and were thanked for their hard work by our boss Ch Insp Brian Duffy. 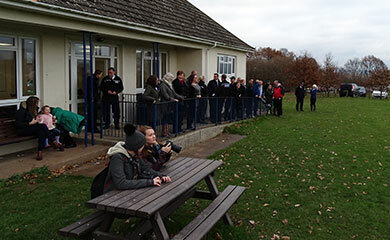 It was then time to complete the photographs and enjoy the buffet. Here are photo’s of the dog teams with their puppy walkers and families. Steve pictured with partner Jane. Steve and Dexter will be stationed at Bodmin. 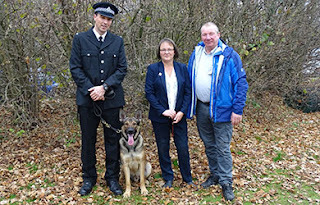 Police dog Reggie with handler Andy Parkin and puppy walkers Angie and Graham Collins. 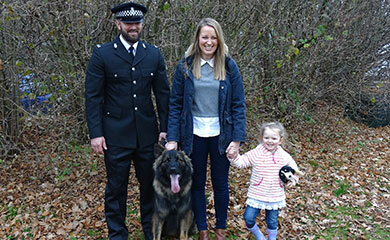 Reggie was diagnosed with OCD in the shoulder at an early age and we thought that was the end of his Police career. However after a successful operation and several months of recuperation and trying to keep the highly energetic Reggie quiet Angie and Graham nursed him back to full health. 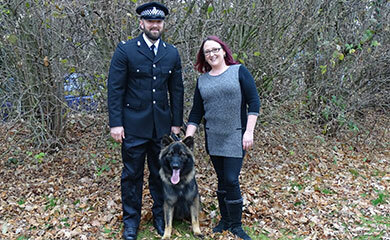 Well done Angie and Graham. Well done Reggie. 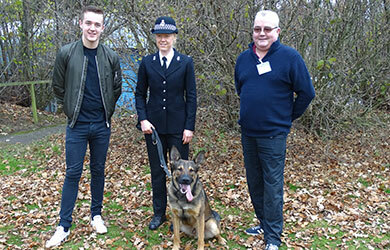 Police dog Riggs is pictured here with handler Vikki Ritchie and puppy walkers Jake and Chris Highton. As reported in previous blogs Chris, Donna, Tom and Jake who are experienced puppy walkers had to give Riggs up after several months because Donna became very ill again and sadly passed away. Riggs was then puppy walked by Steve and Maria pictured here with Vikki and Riggs. Riggs and Vikki will be serving at Ashburton. Police dog Salvi is pictured here with Terri Davies and her partner Mike. 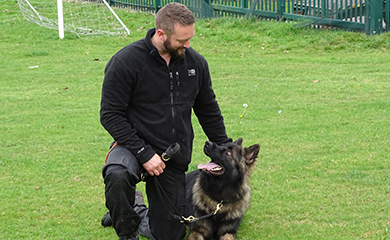 The more astute amongst you who follow our blogs will know that Terri started with TPD Memphis but we had to release him late in the course because his tracking ability didn’t reach the required level despite a 4 week remedial training period. Tracking probably accounts for the majority of our work and although we did get Memphis to track, the level of tracking we need to achieve is very high and requires a natural tracking dog. 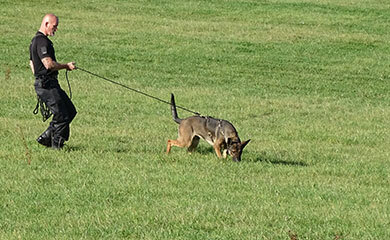 There is a world of difference tracking around dog soiled back alleys in a city centre with multiple cross tracks than tracking on a grass competition field. 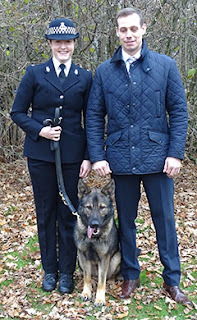 Having won the National Police dog tracking competition trophy 3 times with my dogs Harry and Spud, it still didn’t make them the best operational Police tracking dogs in our force. 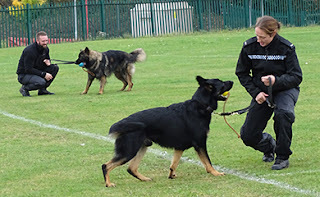 My 2 dogs were good operational tracking dogs but there were much more successful operational Police tracking dogs in my force who never won a competition track. Terri found Memphis a great home where he has 3 acres of land to run around in and horses for company. Salvi is already an operational Police dog and has been for over 12 months with his handler Chris Curnow who retires in February 2017. 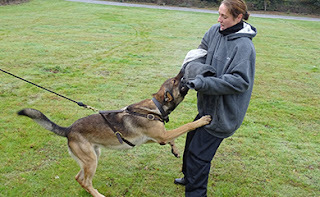 He kindly allowed Terri to have Salvi early and the team have now relicensed together on this Initial course. 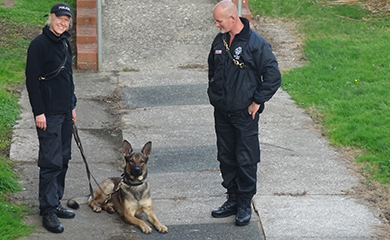 Terri and Salvi will be stationed in Plymouth. 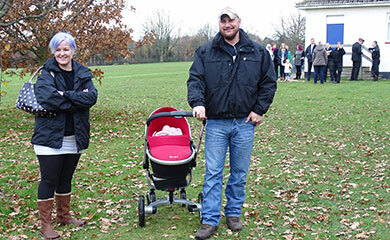 This was a special day for Diana and for us because of the story attached to Jacque. Jacque was purchased as a puppy by her late husband Peter. Diana couldn’t cope with looking after Jacque and her elderly mother after Peter died. 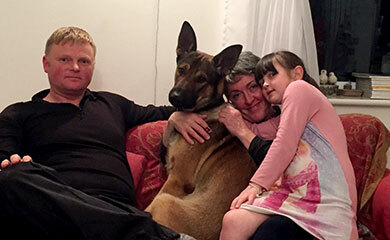 Peter was a retired Police officer and had served in Paignton with Diana. Peter was a good friend of Jack Rule a legendary dog handler in that period and so when Jack died several years ago Peter named Jacque after his great friend. 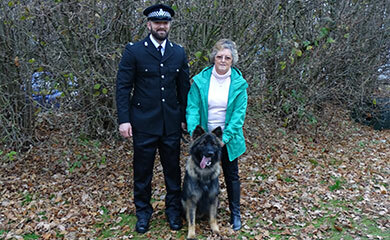 Diana knew that Peter would have loved Jacque to be a Police dog and so donated him to the Police. 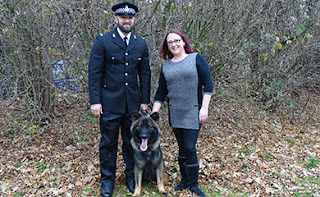 Jacque was placed with puppy walker Heather Iles and she did a very good job looking after Jacque and her young children whilst working part time. Heather was then offered a full time job and couldn’t give Jacque the attention he needed. Graham our course instructor then looked after him until allocation to Luke. 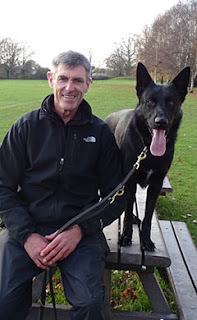 Last but definitely not least is Lenny pictured here with me. I have raised Lenny since he was 4 months after collecting him from Germany. 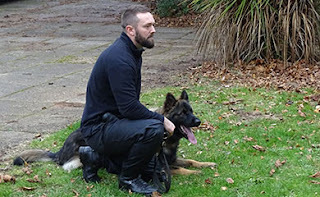 I have trained him and he now needs to be allocated his own handler. 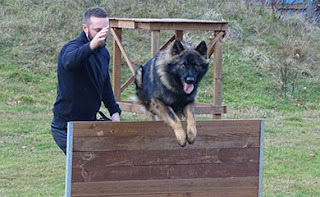 I am dreading that day but he is an exceptional dog who is born to work. Another special guest was Drew Rush who bred our 4 Mali/GSD crosses Dexter, Reggie, Riggs on this course and Cato who will be on the January 17 course. We would like to thank photographer Gina Harrington who took photographs during the course and on our pass out all in her own time. 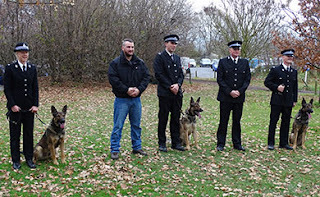 A fantastic day was had by everyone and I am always so proud to see all the dogs graduate and see the happiness of our puppy walkers seeing all their hard work pay off. But I also remember the walkers who are no longer with us and the puppies who didn’t make it. That is why the day is always so emotional for me. 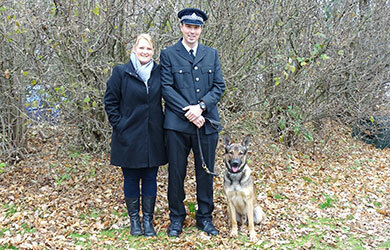 So there you have it the story of our graduated Police dogs. So many twists and turns along the way. Unless you see it first hand it’s impossible to appreciate the hard work and dedication of our puppy walkers and the personal stories behind every puppy that passes through the program. If a puppy has to be released for any reason it is so upsetting knowing all the hard work and emotion that has gone into developing the puppy. 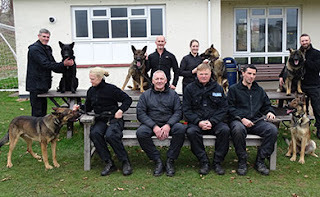 We all grow and develop a bond together on our development days. 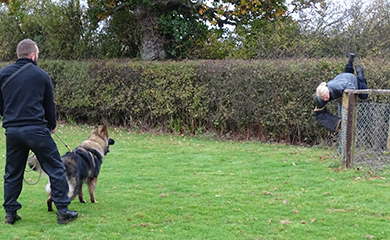 The family are always given first option on keeping the puppy free of charge. 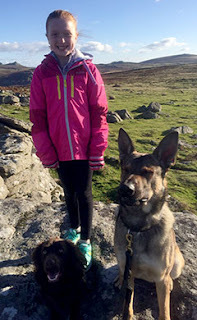 If the puppy walker is unable to keep the puppy we always find a forever home for our pups. Here we all are on Sunday on our Xmas training day with Bevan, Ronnie, the D litter and Rudi. 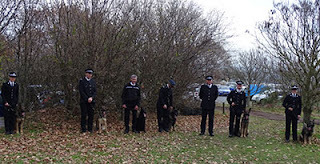 We all had a great day with fun competitions such as fastest recall, best track, best search, best speak on command, best leave of toy, best obedience and with no expense spared a chocolate santa for the winners. This will be my last blog of the year and I hope you have enjoyed them. 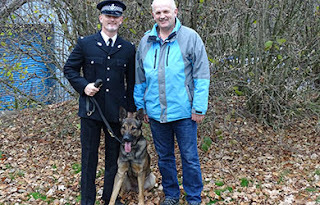 My thanks to Karen Gandy who puts the blogs on for me. 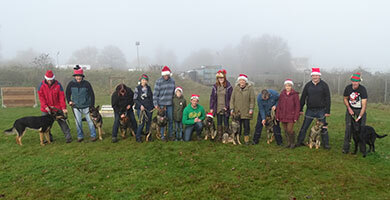 Thanks to all my puppy walkers and my long suffering wife Di for their hard work during the year. 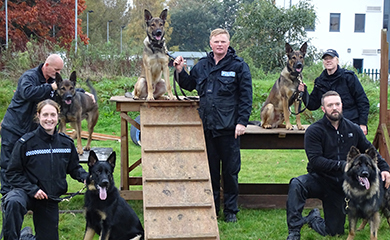 The Initial Police dog course have completed 8 weeks of their 13 week course and the teams are now starting to take shape. 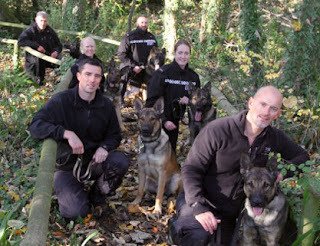 Rear left Steve & Dexter, rear centre Course Instructor Graham & Reggie, rear right Vikki & Riggs, front left Terri & Teague (formerly Memphis ) and front right Luke & Jaccque. The course is progressing very well indeed. 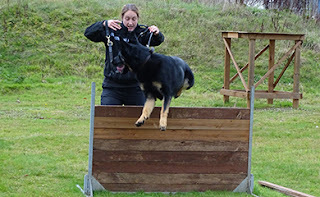 As with all Initial courses there are so many different exercises and disciplines for the teams to master that very few teams just sail through the course without some areas or skills that need special attention. 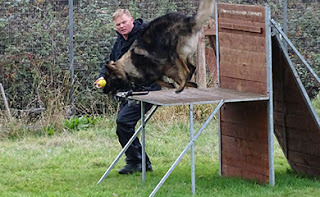 This is the foundation of all of our exercises and so it is practised every day. 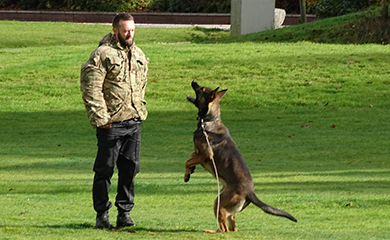 There is no doubt that the dogs absolutely love the course not just because the exercises are so exciting but because they are spending every minute of the day with their handlers which is what the dog craves above everything else in life. 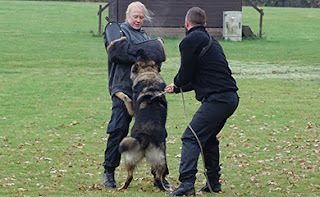 Here are the dogs learning to bite the right arm of the offender holding on tight to prevent their escape until their handler tells them to release. 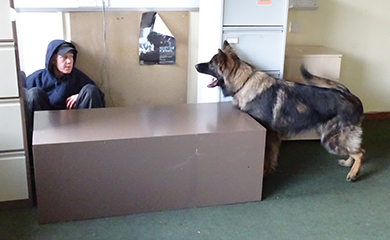 I think it is fairly apparent that Dexter is more than slightly keen to deal with them. 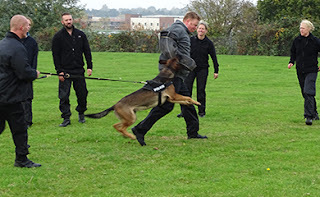 The dogs love the crowd work and get their reward by chasing the crowd back or biting offenders who get too close. 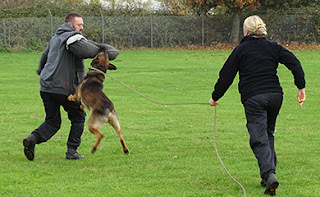 All joking aside that is why it is so important to select dogs with the correct temperament who are able to switch on and off. 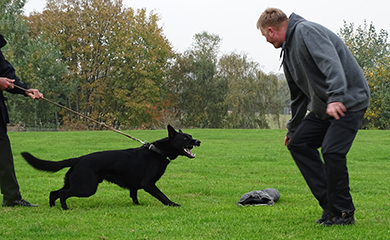 We practise walking through a passive crowd before and after they have been disorderly to condition the dog to understand that aggression only applies to a violent disorderly crowd. That is also why it is important for handlers to perform high visibility foot patrols amongst crowds such as shoppers to ensure the dog maintains the correct perspective with regard to crowds. The stand-off exercise is a very difficult exercise for the dog to master. 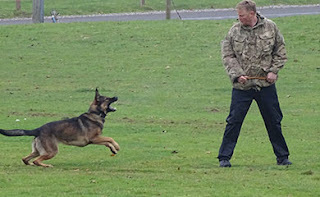 It involves chasing after a person running away but not to bite them if they suddenly stop running and give themselves up. 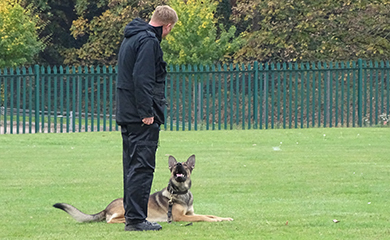 The dog is then required to maintain surveillance on the offender until the handler arrives. The dogs on the course are very athletic and as you have already seen Dexter’s party trick is to walk on his back legs. 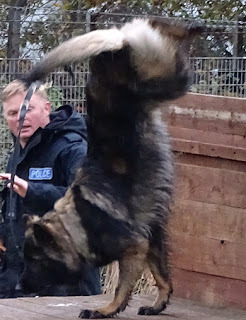 Well Jacque thinks he can top that by walking on his front legs. 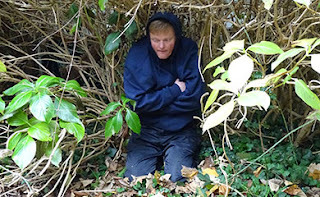 Don’t worry he recovered his composure with no ill effects. 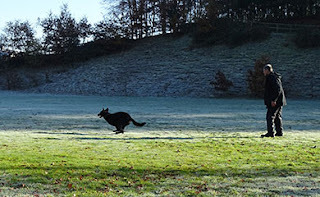 Teague is pictured here doing the hurdle. Tracking probably makes up the majority of our work. 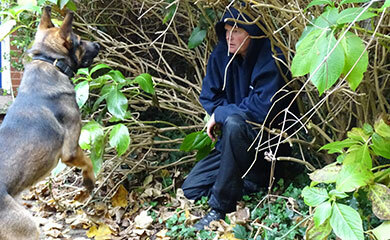 For the uninitiated tracking is the ability of the dog to follow a scent left by an offender or missing person. The dogs can follow a scent for miles in the right conditions and once the dog has locked onto the scent can follow it through crowds of people and over all types of surfaces. Pictured here are Reggie and Riggs hot on the trail of an offender. The dogs are also trained to indicate any items of property discarded by the offender or missing person on the track. 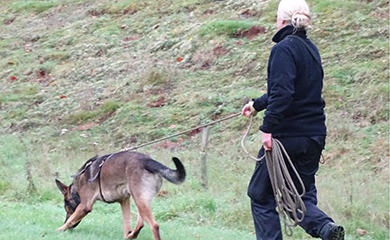 Vikki and Riggs are pictured here having located their Quarry at the end of this track. 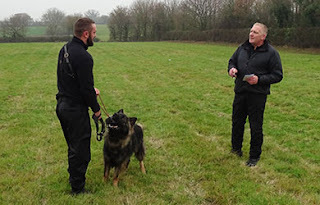 We have had some issues with Teague’s tracking and we had to place him on a special tracking plan for 2 weeks to get him to show a better focus and accuracy on his tracks. We are keeping our fingers crossed that he will now kick on as a result of this extra work. Jacque is pictured here having searched a large building and has located the criminal. 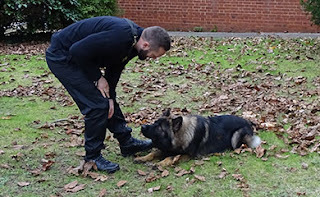 The dogs are trained not to bite but to bark to alert their handler that they have found someone. 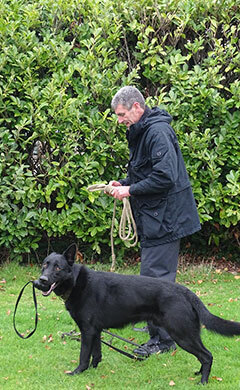 Because Graham is the course instructor and is also handling Reggie the course students often collect Reggie from the van for Graham when it is Reggie’s turn to search. Reggie is pictured here looking into the building and is clearly saying come on Dad I’m here ready to go where are you? I love this photo. The teams will be assessed on their suitability to be operational Police dogs in 4 weeks time by a Police dog instructor from another Police force. Meanwhile my own dog Lenny is being trained by myself alongside the course just in case there are any unexpected developments. 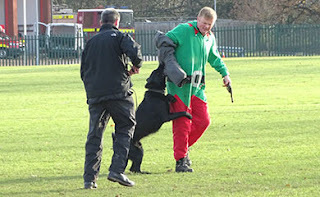 As you can see he is certainly not a dog to back down from a challenge. 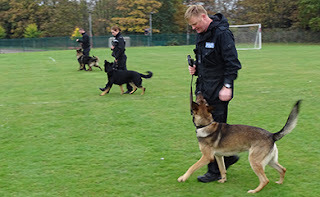 I will be doing an update on how all the dogs get on in 4 weeks time.